The 9th Kuala Lumpur Eco Film Festival is less than a month away and we are gearing up to this ninth installation with some exciting activities for the entire family. Come over to Publika between 14th October and 16th October and start your journey to sustainable living with us. You will be so spoiled with film choices this year. 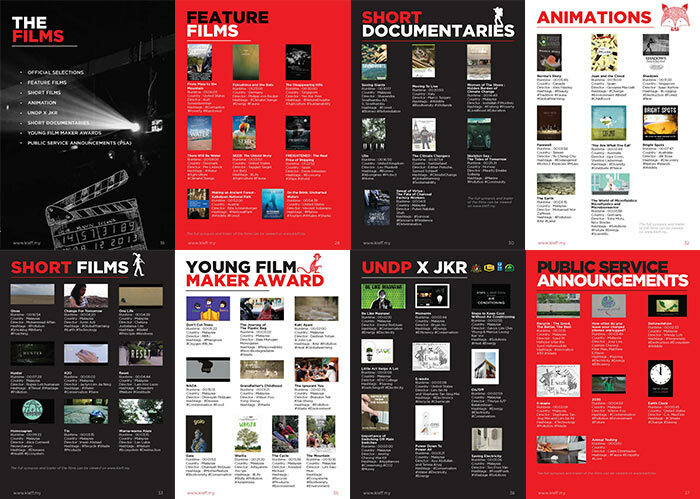 Screening more than 80 environmental film of all genres (short films, documentaries, etc), make sure you also check out the Official Selections for this year and make a date with the film makers as well. All film screenings are free however seats are on a first-come, first-serve basis so we highly encourage you to reserve your film tickets. The Green Market is also back with loads of fun workshops on sustainable living and a range of NGOs and green businesses exhibiting and promoting their green products and services. Together with the Ministry of Green Technology, Water and Energy (KeTTHA) and GreenTech Malaysia, we present the “Jom Beli Produk Hijau” campaign where MyHijau certificated products and services will be promoted to the public to enhance awareness on sustainable consumption and production. 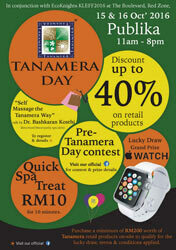 The Green Market also celebrates Tanamera Day which will have amazing discounts, workshop the benefits on self-massaging and attractive prizes to be won at the Tanamera Tropical Spa Products pavilion. Make sure you check out their website too to see what’s on offer. You’re also cordially invited to our Awards Ceremony happening on 14th October at the Black Box to find out who will be bagging these year’s awards ranging from Best Documentary to Best Short Film. We are happy to share that this year’s trophies are super special as it’s locally crafted by a local artisan based in Tapah. Made from cempedak and mangosteen trees that were removed (the mangosteen was struck by lightning at the farm while the cempedak tree was no longer fruiting) from the farm, each trophy is unique in its shape, size and texture. You’re also cordially invited to our Awards Ceremony happening on 14th October at the Black Box to find out who will be bagging these year’s awards ranging from Best Documentary to Best Short Film. More than a dozen workshops, talks and nature-related exhibitions will be made available to the public. Do check it out here and make sure you sign up for them! (Some workshops have terms and conditions). For the full line up of activities and film screening, head over to the official website here or download a copy of the 9th KLEFF Festival Guide here in PDF and keep it handy in your smart device. If you’re interested to be in the action of the Festival, do sign up as a volunteer here and be part of the festival vibes and make some awesome friends. To check out what a volunteer does, download the KLEFF Volunteer Guide here. This year’s Festival would not be possible without the collaboration and support from Publika Solaris, DHL Malaysia, KeTTHA, GreenTech Malaysia, Vive.com, UBER, SCM, Tanamera Tropical Spa Products, IM4U.fm, IM4U volunteers, Core Resources, 3Ciety.com, UNDP-BSEEP, ERE Consulting Group Sdn Bhd, Digi Telecommunications, and all our university partners.